The fire extinguisher(s) in your building may be its most important piece of hardware should an emergency unfold. That means your building’s fire extinguisher cabinets are the second most important piece of hardware. With that critical level of importance in mind, Front Royal, VA-based Strike First Corporation of America builds every fire extinguisher cabinet your organization, business, job site or institution will ever need. Strike First’s cabinets are manufacturer from a range of highly durable materials; from white baked enameled steel to stainless steel, aluminum to plastic to galvanized steel. Ideal for high-traffic industrial locations, Strike First fire extinguisher cabinets resist bumps, scrapes and the everyday wear and tear – which could damage or puncture unprotected fire extinguishers – while clearly marking their locations throughout a building. The cabinets also discourage the misuse, vandalism and theft of fire extinguishers, as well as keeping the equipment inside free from dirt and grime. They feature a front vision panel to clearly identify the extinguisher stored inside, with either a clamp or lock for security. For customers looking for a mobile, clearly marked, weatherproof outdoor fire extinguisher cabinet, check out Strike First’s line of portable fire extinguisher stands. A full catalog of other Strike First hardware can be found on their website here. Here at Jersey Architectural Door & Supply Co., we know what it takes to make a building safe. A huge part of any building’s safety plan should be clearly marked, easily accessible fire extinguishers. Both of these factors are achieved with Strike First fire extinguisher cabinets. These cabinets keep extinguishers safe from damage, obvious to locate and easy to deploy in an emergency. From New York to Pennsylvania to the New Jersey Metro areas, when building owners and managers needs reliable fire safety equipment, they know the name Strike First stands for quality and reliability. And when those same buildings owners and managers need quality building materials shipped direct at competitive prices, with delivery and installation by industry professionals, they think Jersey Architectural. So give us a call today, take advantage of our one, five or 10-day QuickShip™ options to have fire safety hardware like Strike First fire extinguisher cabinets and much, much more delivered direct to your door. 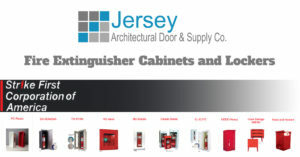 Want To Know More About Strike First Fire Extinguisher Cabinets Offered By Jersey Architectural?